Located in a premium gated community in Dubai, the displayed villas for sale in Reem are perfect opportunities for those looking for an exquisite home to live or for a lucrative real estate investment. 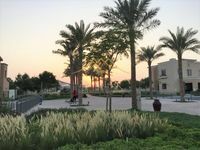 Reem is a closed community that includes many clusters of villas and townhouses scattered along with expanses of green areas, parks, pathways, and large desert inspired landscapes. Developed by Emaar, the community offers upscale lifestyle for its residents. It’s like a green oasis sitting in the middle of the desert and granting its inhabitants a soothing sanctuary from the bustling life of Dubai metropolis. With a great emphasis on desert environment, home designs in Reem community reflect the Arab traditional architecture mixed with contemporary hues. No matter what kind of villa you are looking for in Dubai, you’ll definitely find it in Reem. The community has a wide range of villas located in its two villa communities, Mira and Mira Oasis. All displayed villas for sale in Reem community are spacious to cater large ambience and privacy to its residents. They vary in size between three-bedroom, four-bedroom, five-bedroom, and six-bedroom villas. To grant its residents total comfort and convenience, the villas are attached with a wide set of special amenities like swimming pool, sauna, fitness gym, car parking, entrance garden, and many other. Also, life in Reem community is completely eased thanks to the available schools, retail centers, mosques, clinics, and other facilities. The community homes a wide range of townhouses also scattered throughout its clusters and ranging in size to meet all demands. 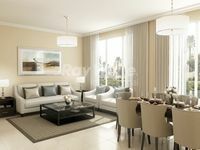 Residential units in Reem are well suited to fit families needs. Ranging between furnished, semi furnished and unfurnished villas, the displayed villas for sale in Reem Island are available in big variety. Some buyers prefer furnished villas as they are ready to use, others prefer unfurnished ones since they will have the opportunity to fit their homes out. 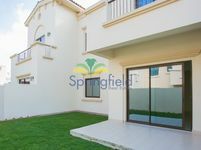 Prices in Reem starts from AED 1.6 million for two-bedroom villa. To compliment its luxury, Reem lies in a very close proximity to many hotspot destinations of Dubai like Arabian Ranches Club, the Global Village, and Dubai Polo & Equestrian Club. It has also a cinema theater, golf course, and several sports facilities. Life is totally different in Reem from what you’ve been used to. Developed by Emaar in total conformity with top-notch construction and finishing qualities, the community is master planned to be at resident’s convenience. Finding a villa to buy in Reem is way easier through Just Property. The variety offered is never found in any other venues, also the properties are picked by well versed real estate professionals who know exactly what searchers are looking for. No need to hassle with real estate agents and brokers, a large assortment of villas is waiting for you, just browse the list and choose. In simple clicks, you can change the listings’ arrangement either to start from lowest to highest price, or to be arranged according to publishing date.